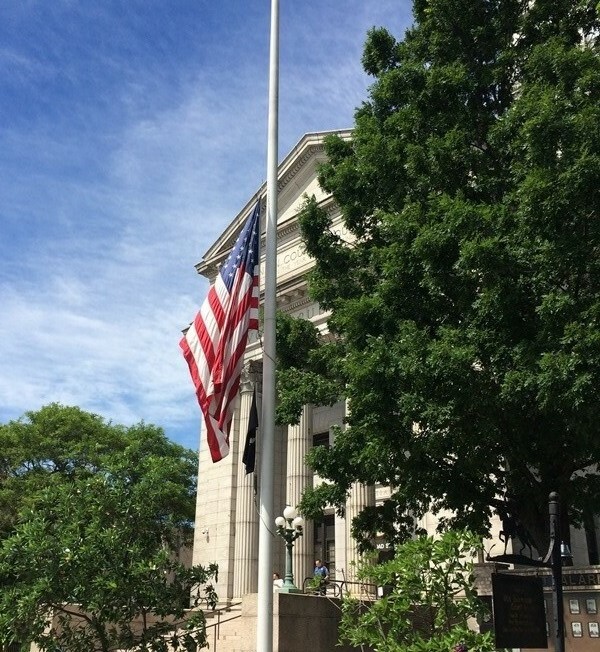 Union County, NJ – In honor of National Flag Day, Union County Clerk Joanne Rajoppi reminds residents that torn or tattered American flags may be dropped off at her offices in Elizabeth and Westfield for proper retirement. “Each year, we affirm the sentiment of Flag Day by reminding Union County residents of the United States Flag Code, which calls for a tattered or worn flag to be disposed in a manner consistent with its role as the symbol of our nation,” said Rajoppi. National Flag Day is held every year on June 14, as part of National Flag Week. Union County residents can bring flags that are no longer fit for display to the County Clerk’s offices any day of the year during regular business hours for proper retirement. Ms. Rajoppi also noted that on June 13, flags in Union County were lowered to half-mast in support of the Orlando community, in the aftermath of a mass shooting at a popular LGBT nightclub. National Flag Day was first officially affirmed by presidential proclamation in 1916, two years after the start of World War I. In 1949, shortly after the end of World War II, an Act of Congress designated June 14 of each year as National Flag Day. Flags for retirement may be left with staff at the County Clerk’s main office in the Union County Courthouse, 2 Broad Street, Room 115, in Elizabeth; and at the County Clerk’s Annex in the Colleen Fraser Building, 300 North Avenue East, in Westfield. The Elizabeth office is open from 8:30 a.m. to 4:30 p.m. Monday through Friday. The Westfield office is open from 8:00 a.m. to 7:30 p.m. on Tuesdays and Thursdays; 8:00 a.m. to 4:00 p.m. on Mondays, Wednesdays and Fridays; and 9:00 a.m. to 1:00 p.m. on Saturdays. For more information about the Union County Clerk’s flag retirement collection program, please call 908-527-4787. For all County Clerk services ucnj.org/county-clerk. For a directory of veterans services in Union County, including a list of local VFW posts, visit ucnj.org/hero.